Residents who actively attend their local municipal meetings might be “in the know” with regard to the environmental mandates that the EPA has placed on municipal governments and have probably heard the words “stormwater pollution” or “NPDES” mentioned over the last several years. But what does all of this mean to a household? Part 1 of our mini series regarding stormwater pollution will address how residents can help do their part for the good of the environment. 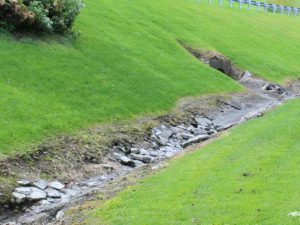 NPDES is the acronym for National Pollutant Discharge Elimination System, which, simply put, means getting rid of as many pollutants as possible from rain or snow melt events that flow over the land before it reaches local surface waters. Here we will touch on some tips for healthy household habits. After a snowmelt or a steady rain, salt and other de-icers runoff into the inlets and pollute our streams and rivers and ultimately impact our drinking water and animal habitats. The salt depletes the oxygen content in aquatic ecosystems which is harmful to fish and aquatic plant life. Salt can also deplete the soil of beneficial bacteria and nutrients and inhibit future plant growth come spring. If using de-icer, limit the quantities used to only what is needed to do the job. Consider throwing down salt before it snows. The de-icer can last longer and have a greater efficiency if applied before the snowfall. It prevents ice from bonding to the pavement and allows for easier cleanup. The less salt used, the better for protecting our watersheds. Do not use sand or kitty litter. 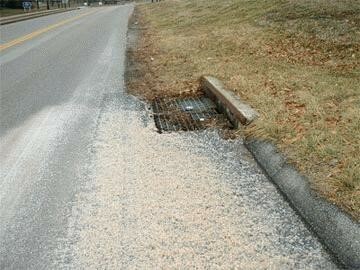 Sand and kitty litter can obstruct the inlets and outfalls and are harmful to aquatic life and our drinking water. Consider the use of alternative solutions. In addition to the aforementioned rock salt (Sodium Chloride), Calcium Chloride and products with Potassium Chloride can be used safely. Other alternatives include Calcium Magnesium Acetate and Potassium Acetate (chloride free).